NOTICE OF STUDY COMPLETION: November 11, 2013. Public comment period until December 20, 2013. ► Click to view the NOTICE. 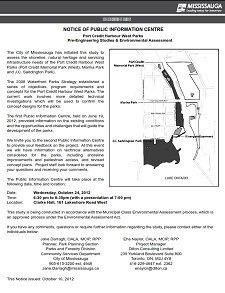 ► Click for the City's study WEBPAGE and link to the Pre-design Report/Environmental Study Report - October 2013 (490p PDF). 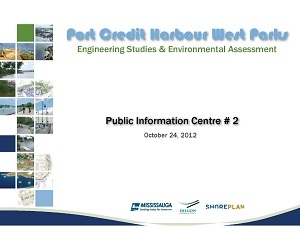 PORT CREDIT HARBOUR WEST PARKS - PUBLIC MEETING #2: October 24, 2012. 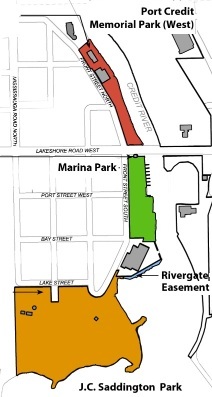 The City has initiated this study (Notice) to assess the shoreline, natural heritage and servicing infrastructure needs of Port Credit Memorial Park West, Marina Park (boat launch) and Saddington Park in advance of re-designing the three (3) harbour-area parks. ► Click MAP (taken from Slide #6) to view the October 24, 2012 PRESENTATION (28p PDF) which shows the consultants' preferred options for re-developing the (3) parks. ► Click image (L) for Oct. 24 MEETING NOTICE. 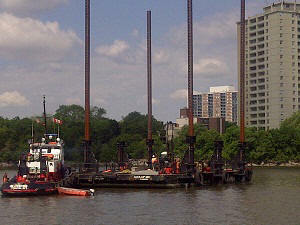 ► Click photo image for enlargement -- Soil-Mat Engineers conducts EA work in the PC Harbour, June 22, 2012. Photo credit: Jim Danahy.